Would a rose by any other name be any less red? Nope! Share your romantic sentiments here for the Love Poem Contest! Be sure to include your IGN and server with our submission. Simple text is fine for the submission. Always hard to explain, why her gaze captivates. It's Snowing in Jianghu, and our foes...Cold as Ever. Last edited by TonyDuong on Fri Jun 03, 2016 6:16 pm, edited 1 time in total. if not, for the eternal night. It appears he left me for this Emei HO! I'll equip my drunken fist and knock them out! On this cold and snowy night..? Last edited by 115915935043289775512 on Sat Jun 11, 2016 5:59 pm, edited 1 time in total. WooDang Man wrote: Would a rose by any other name be any less red? Nope! 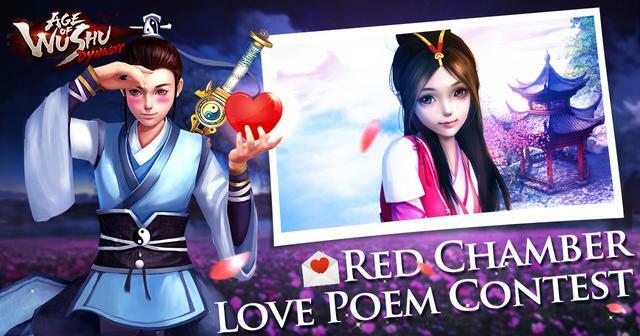 Share your romantic sentiments here for the Love Poem Contest! But we will overcome all things that happened to us. Fight couldn't be avoided in Jianghu. But my love will passed all trials. And the time we will marry.